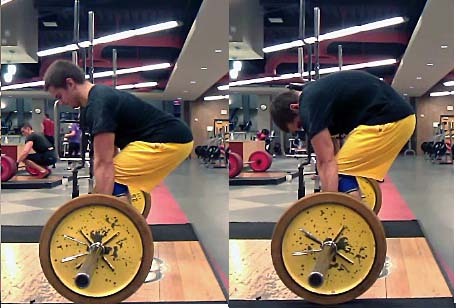 As highlighted in many of our previous articles, one of the best exercises you can do in weight training is the Squat. It is primarily a lower body exercise, but it cannot be restricted to being called an isolation type movement. It hits your entire body and be ready to feel “the good pain” all over your body after a gruelling squat session. Most strength athletes would confirm the fact that for developing impressive legs, you cannot get away by ignoring the squat. No machine can replicate the effect of squat and hence it is the most vital part of every training regime. Because of the complex nature of the exercise, people often get many things wrong with the movement and end up injuring themselves. Since it is a heavy movement, proper precautions must be taken in order to get the maximum out of every repetition of squat that you do. Hence, here is a guideline to follow while Squatting heavy. This is one of the biggest mistakes that you can do in the squat. Stopping very high in the descent will effectively turn you into an Ego lifter. Also, do this repeatedly and ultimately you will end up destroying your knees. Correction:- The correct way to do the movement is to reduce the weight and go down until you can’t go any further, like any Olympic weightlifter would. This is the best way to develop that front quad sweep that looks so impressive. When getting up from the bottom position, “the hole”, with a heavy weight, your knees tend to collapse inside and stick together. This hurts your knees and you won’t be able to transfer the maximum power over to the bar from this position. Correction:- Point your toes away from each other in your initial set up. Again, when you get up with the weight, your body tends to shift the weight from your entire foot to the front part of your feet, hence lifting your heels off the floor. This is also a position in which you won’t be able to transfer the maximum power to the bar and also, you may end up injuring your Achilles’ tendon in the process. Place a small plate under your heel or purchase Olympic lifting boots or shoes with a raised heel. It is natural that the lower back rounds when a heavy weight is put on the back. This may happen due to weak core muscles or bad initial positioning. Anyway, this might result in damaging the spine. Correction:-Keeping the upper body more erect. Use A belt without cushioning support. Train abs more often. Hitting proper depth in the squat. Maxing out too often would overload your Central Nervous System, causing you too feel fatigued all the time and not being able to perform at your max every session. It’s important to stay focuses on your goals and structuring your training routine according to them. Correction:- Max out not more than once every month. Keep the reps between 6 -10 to increase muscle mass as well as strength. Front squat is one of the best exercise to condition your core, upper back and your quads. It emphasises more on the quads than the posterior muscles (Hamstrings and gouges) in comparison with the back squat and hence you should do these more often in place of the back squats if you have weak quad muscles. Correction:- You may want to replace the back squat with the front squat every third workout. Many people have been taught the squat wrongly. They bend their upper part to much and convert the squat into good morning-ish movement. This is extremely counterproductive as it puts more stress on the lower back and hips, not the legs. Keep your body as erect as possible while going down. Some people always work with a higher reps and lower weight while others always overload the bar. Either way isn’t right. Always mix up the weight. If you have been focusing on the reps for the past month, use heavy weights or 5×5 rep scheme for some time. This hurts your shoulders and hence you place a cushioning element between the bar and your neck. To avoid this, place the bar a little lower on your back, so that your forearms are also in a supporting position for the bar and you can effectively relieve some stress from your upper back. So the next time you position the heavy barbell behind your head, try to remember these basic points for a smooth and effective workout. Next articleHow Many Calories Are There In a Roti & What are Its Health Benefits?